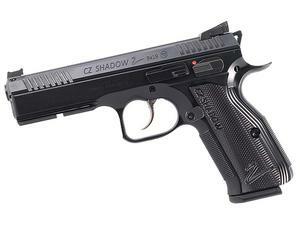 Starting from scratch, CZUB engineers took the best features of the original Shadow and improved upon them. More than two years later, they're seeing the fruits of their efforts. With a higher beavertail and undercut trigger guard, the shooter’s hand is able to be as close to the bore axis as possible. With a contoured slide, the majority of the reciprocating mass is also centered on the bore, equating to less muzzle flip. Increased weight at the dust cover/rail also helps keep the muzzle down. A polycoat finish coats the entire pistol, leaving it nearly impervious to corrosion. Thin aluminum grips have healthy checkering to match the fine front and backstrap checkering of the pistol itself. Sitting atop the slide are a set of target sights — fiber optic on front and a serrated, black HAJO rear (click adjustable for elevation, drift adjustable for windage).